A broadband and digital TV bundle allows you to group all your home telecoms services together so you have one service provider for them all. Bundling broadband with digital TV and a home phone means that not only are you paying fewer bills, you're also saving on your monthly telecoms costs. By choosing a broadband and digital TV package that also comes with a home phone option, you could save hundreds of pounds per year. Different broadband and digital TV packages will provide your digital TV in different ways. You can watch digital TV at home via cable, satellite, IPTV, or just through your TV aerial using a Freeview or digital set-top box. Satellite: Satellite TV, as the name suggests, delivers TV into your home via communications satellites. You need a satellite dish and a receiver box in your home for this to work. Cable: Millions of UK homes can get digital TV through the UK's cable networks. Cable TV delivers TV into your home using a network of fibre-optic cables. IPTV: IPTV delivers TV over your broadband connection. For more information about how IPTV works, see our guide on what is IPTV. Freeview box: Freeview is a free terrestrial digital TV service, accessed using a set-top box. YouView: YouView is an easy to use, subscription free TV service with over 70 digital channels and seven-day catch-up on BBC iPlayer, ITV Player, 4oD and more. YouView boxes come free with BT and TalkTalk bundles. As more and more of us decide to opt for broadband and digital TV bundles, heavy competition is driving providers to offer better and better deals. Most of these ISPs offer broadband with digital TV and a home phone. It's important to remember that you can only get Virgin Media's digital TV service if you are in a cabled area. To find out more about cable services and compare all cable deals see our cable broadband page. Virgin Media's cable broadband and digital TV bundles are made up of different components, which you're free to mix and match. 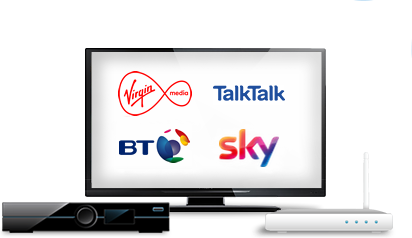 This means that with a Virgin Media broadband and TV package, you should be able to get exactly the right combination of broadband package, digital TV package and phone package in your bundle. Choose Virgin Media's entry-level broadband package and you can expect average speeds of 54Mbps. Opt for the company's top-end service and you can expect average speeds of 362Mbps in areas where the network has been enhanced as part of Virgin Media's ongoing upgrade. If you're not in those locations, your maximum speed tops out at 213Mbps. All Virgin Media broadband products include a free wireless router and unlimited download allowance. Virgin Media's TV service offers a massive range of TV standard definition, HD and 3D channels delivered through the cable network. You need a Virgin Media TiVo box or its new V6 box to receive Virgin Media TV. Virgin Media now offers an app for iPads, iPhone and Android devices called TV Anywhere. The app is free to TV customers and allows you to watch shows live on your handheld device. You can also use it to control your TV, record whole series and remotely manage your recordings on your set-top box. Satellite TV from Sky changed the landscape of British broadcasting forever. And now, Sky TV and broadband is among the leading providers of broadband and TV packages. All Sky packages include a free wireless router, Sky Broadband Shield (an internet security package) and Sky e-mail. Although Sky broadband is an excellent service, perhaps the main reason that people take Sky internet packages is they allow subscribers to bundle together Sky TV and broadband deals and save money. Sky digital TV offers more than 100 digital entertainment channels, with the option to build a digital TV package tailored to your own viewing preferences. Dedicated sports-focussed Sky TV deals and movies packages are available that you simply choose to add to your broadband and digital TV bundle. Sky digital TV is received via satellite and requires the user to have a digital set-top box. Sky TV deals come with the Sky Q set-top box. Additionally, subscribers to Sky TV offers also benefit from the free Sky Go app. This lets them watch Sky TV shows on their tablet, PC or smartphone for no extra charge. BT has made the most of the bundle revolution by offering great value home broadband and free digital TV bundle deals to go with their home phone packages. BT's TV service is delivered via a YouView set-top box, which allows you to pause and rewind live TV and, if you have the YouView+ Ultra HD, you can record shows, too. Perhaps the biggest selling point of BT's TV offering is BT Sport, which has the broadcast rights to live Premier League games. BT Sport is included with both the Starter + BT Sport package and the Total Entertainment package. If you're not on either of these, you can add BT Sport for a small monthly fee.